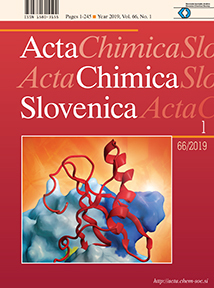 Acta Chimica Slovenica (ACSi) provides a forum for the publication of original and significant work in the chemical and closely related areas of research. Reviews, scientific and technical articles, and short communications are welcome. The journal is published quarterly, and full text version of the papers published since 1998 to date are available free of cost at http://acta.chem-soc.si in Acrobat portable document format (pdf). In the appendix, the journal publishes book reviews, industrial achievements, announcements, and Society news.